Two jellies have contributed to Nobel Prize winning research: The Nobel Prize for Physiology or Medicine in 1913 and the Nobel Prize in Chemistry in 2008. In both cases the animals were actually hydrozoans: Physalia physalis, the Portuguese Man-of-War, and Aequorea victoria, the Crystal jelly. The 2008 prize was awarded for the discovery of green fluorescent protein, also known as GFP, isolated from thousands of jellyfish at the San Juan Islands. This molecule has been critical in advancing research in genetics, development, and evolution, where it is commonly used to tag genes of interest in a variety of animal models (see Mills 2009 for an overview of A. victoria and some of the misconceptions about its bioluminescence). 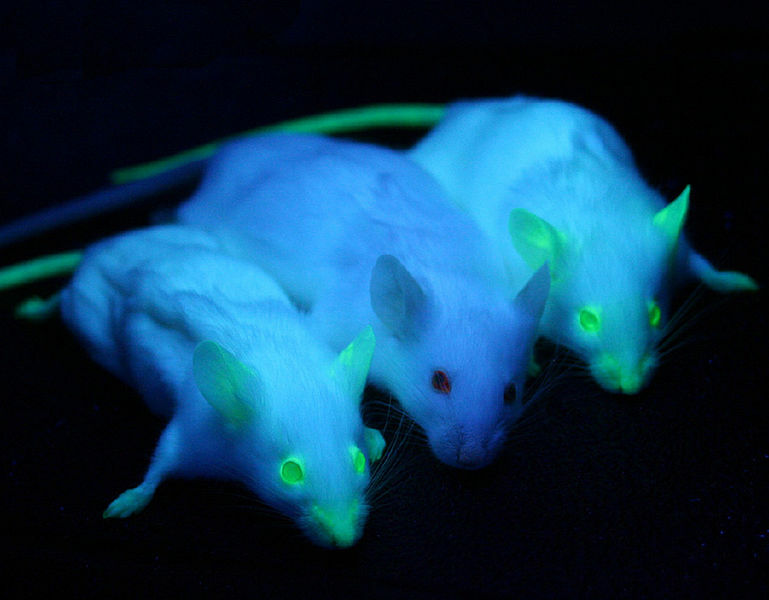 GFP mice under a UV-light flanking non-GFP mouse. GFP, isolated from the Crystal Jelly, can be used to tag genes of interest in other animals. Downloaded from Wiki Commons. The 1913 Prize was awarded to Charles. R. Richet, professor of physiology at the University of Paris, “in recognition of his work on anaphylaxis.” His findings emerged directly from work on the venom of P. physalis and later the sea anemone, Actinia sp. Anaphylaxis is an immune response where a small exposure to a toxin or allergen results in a severe reaction upon later exposure, even after a significant period of time since the first exposure. Richet’s work on anaphylaxis began on a scientific cruise headed by Prince Albert of Monaco, an avid oceanographer, aboard the Princess Alice II on 5 July 1901. He worked in collaboration with Paul Portier and Georges Richard, brought together by the Prince, to study the toxic effects of Man-of-War venom that frequently tormented fishermen. Theses researchers brought along several experimental animals, including frogs, guinea pigs, ducks, and pigeons. Each animal would become paralyzed when injected with venom-infused glycerol from the tentacles of the Man-of-War. After their journey at sea, Richet and Portier continued working on the effects of venom using sea anemones of the Genus Actinia. These anemones were common along the shores of France, so large numbers could be collected to obtain the volume of venom needed for their experiments (and later to isolate actinoporin, a cytolytic (cell-bursting) toxin from sea anemone venom). Richet and Portier’s hypothesis was that small injections of jellyfish or anemone venom might inoculate their subjects against later exposure and reduce symptoms, maybe even increasing their resilience to future stings, like vaccines. Using the same technique of dissolving the sea anemone venom into glycerol, they injected pigeons and guinea pigs, but eventually moved to dogs because of their higher resistance to the toxin. 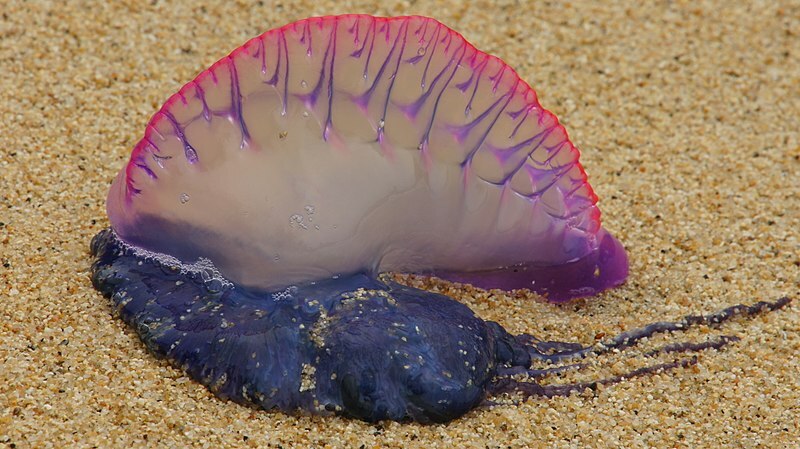 The Man-of-War (Physalia physalis) washed ashore with float intact. From Wiki Commons. Commemorative stamp released by Monaco in 1953 5o celebrate the 50th aniversary of Richet and Portier’s discovery, depicted the two scientists and Prince Albert also with a larger Man-of-War. From http://dx.doi.org/10.1136/jnnp.70.2.255. Their original findings were not particularly interesting; the first injection would induce a depressive state in dogs, similar to those of the other animals, or even no symptoms at all. But, they found that a second injection 2-3 weeks later resulted in total body failure and death. Even when both injections were extremely small, and even if the dog showed no symptoms from the first injection, the result was the same: death within a few hours! Richet named this phenomenon “aphylaxis,” derived from the Greek word for protection (“phylaxis”). He later changed to “anaphylaxis,” because it sounded better (and I am inclined to agree). Both researchers published their work in 1902, but Richet would continue to work on anaphylaxis while Portier returned to his job as a laboratory assistant. When I ask folks if they have every been stung by a jellyfish, I occasionally get someone that was stung by a Portuguese Man-of-War. These animals are incredibly painful stingers, though usually the pain subsides in a few minutes to a few hours; scarring is also typical but often goes away after a few days (Tibballs et al 2011). Occasionally stings results in more severe reactions, like headaches, vomiting, digestion issues and abdominal pain, and a few people have died from cardiovascular toxicity, potentially caused by allergic reactions to the venom (i.e. anaphylaxis) (Tibballs et al 2011; Badre et al 2014). Man-of-Wars are actually members of a group called siphonophores, an order in the Class Hydrozoa that contains slightly less than 200 species. Siphonophores are colonial cnidarians, composed of genetically-identical animals, called zooids. Zooids are separated by function into specific types– food capture and defense (dactylozooid), digestion (gastrozooid) , reproduction (gonozooid), and the gas-filled float (pneumatophore). The warship shape of the Man-of-War pneumatophore gives them their common name. The danger of these floats are when smacks of these animals (smack = group of jellies) are moved towards the shore by the wind, where their 40 foot long (or longer!) tentacles get pushed to the shoreline or break off in the waves. Man-of-War showing where different zooid types are located. The long, hanging tentacles are the usual culprits for human stings. From Pinterest. The bad news for people is these large creatures are designed to capture fish, so their venom has to be fast-acting and likely targets blood and muscles. They are also a colony that needs to share food, so this fast-acting venom also needs to digest food quickly and efficiently. All of this works would to mean painful stings that can occur when these tentacles break off into the water to be washed up on the beach, in addition to being stung by the animal itself. These are one of the most widely encountered species, thanks to the winds that blow these animals towards crowded beaches in tropical waters around the globe (e.g. Ferrer and Pastor, 2017). After Richet and Portier’s discovery, Man-of-War venom continued to be widely studied, and remains one of the most well understood hydrozoans in terms of venom diversity. In 1980, physalitoxin was isolated from several Man-of-Wars, a potent hemolytic toxin that makes up about 28% of venom isolated from stinging cells (and the first study to isolated a cytolytic toxin directly from the stinging cells of a jellyfish) (Tamkun and Hessinger, 1981). Hemolysis, the mechanism of rupturing blood cells, has been documented in crude and fractionated venom from several studies on Man-of-Wars, and, to the best of our understanding, is one of the most potent hemolytic toxins studied that from a hydrozoan (Mariottini 2014). 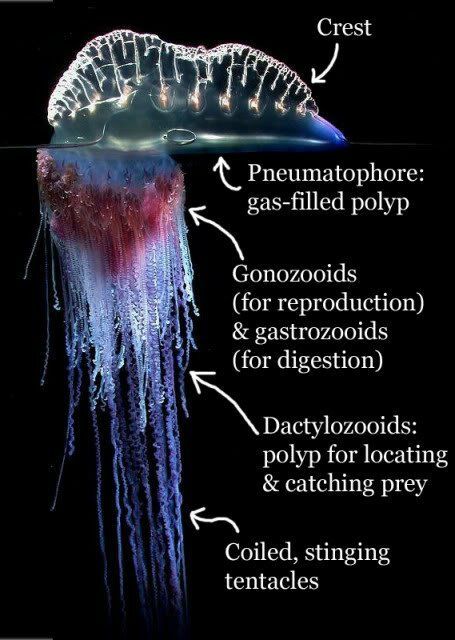 Later work indicates Man-of-War venom may also contain additional pore-forming toxins that target different cell types (Edwards and Hessinger 2002; Edwards et al 2002), as well as neurotoxins and toxins that target insulin-secreting cells (Badré et al 2014). Badré, S. (2014). Bioactive toxins from stinging jellyfish. Toxicon, 91, 114-125. Dworetzky, M., Cohen, S., Cohen, S. G., & Zelaya-Quesada, M. (2002). Portier, Richet, and the discovery of anaphylaxis: a centennial. Journal of Allergy and Clinical Immunology, 110(2), 331. Ferrer, L., & Pastor, A. (2017). The Portuguese man-of-war: Gone with the wind. Regional Studies in Marine Science, 14, 53-62. Mills, C.E. 2009. Bioluminescence of Aequorea, a hydromedusa. Electronic internet document available at http://faculty.washington.edu/cemills/Aequorea.html. Published by the author, web page established June 1999, last updated 11 January 2009. Tan, S. Y., & Yamanuha, J. (2010). Charles Robert Richet (1850-1935): discoverer of anaphylaxis. Singapore medical journal, 51(3), 184. Tibballs, J., A Yanagihara, A., C Turner, H., & Winkel, K. (2011). Immunological and toxinological responses to jellyfish stings. Inflammation & Allergy-Drug Targets (Formerly Current Drug Targets-Inflammation & Allergy), 10(5), 438-446. Tamkun, M. M., & Hessinger, D. A. (1981). Isolation and partial characterization of a hemolytic and toxic protein from the nematocyst venom of the Portuguese Man-of-War, Physalia physalis. Biochimica et Biophysica Acta (BBA)-Protein Structure, 667(1), 87-98. Kemp, S. F., & Lockey, R. F. (2002). Anaphylaxis: a review of causes and mechanisms. Journal of allergy and clinical immunology, 110(3), 341-348.